AgileBits has released 1Password 7 for Mac, a significant update that is free to subscribers but also available as a standalone download. I’ve used 1Password since I started using a Mac. The app has always been the best way to store passwords for websites, and for years, that’s primarily how I’ve thought of it. There’s been more to 1Password than just password storage for a while now though, and what sets this update apart is the depth of those other features and the ease with which they can be incorporated in your everyday computing life. That’s important because it doesn’t take much friction for someone to get lazy about security. 1Password 7 is a comprehensive update that touches every corner of the app. The app will still be familiar to long-time users, but features like Watchtower and Vaults have been extended with new capabilities that are worth exploring if you haven’t in a while. 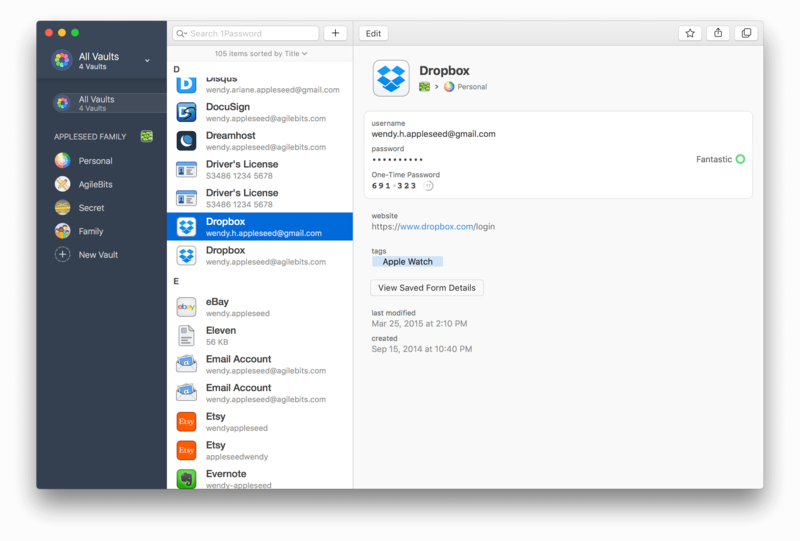 1Password also works better than ever with app logins. There are dozens of other changes big and small that along with a design refresh that make 1Password 7 an excellent update. Apple's iOS Security guide is one of the most fascinating technical documents I've read in recent years. While the topics are intricate, they're presented clearly in readable English. Earlier this week, the document was updated with new information on the latest additions to the iOS ecosystem – including Face ID, Apple Pay Cash, and Password AutoFill. There are some interesting details I didn't know in each section. Facial matching is performed within the Secure Enclave using neural networks trained specifically for that purpose. We developed the facial matching neural networks using over a billion images, including IR and depth images collected in studies conducted with the participants’ informed consent. Apple worked with participants from around the world to include a representative group of people accounting for gender, age, ethnicity, and other factors. The studies were augmented as needed to provide a high degree of accuracy for a diverse range of users. Face ID is designed to work with hats, scarves, glasses, contact lenses, and many sunglasses. Furthermore, it’s designed to work indoors, outdoors, and even in total darkness. An additional neural network that’s trained to spot and resist spoofing defends against attempts to unlock your iPhone X with photos or masks. When you set up Apple Pay Cash, the same information as when you add a credit or debit card may be shared with our partner bank Green Dot Bank and with Apple Payments Inc., a wholly owned subsidiary created to protect your privacy by storing and processing information separately from the rest of Apple and in a way that the rest of Apple doesn’t know. This information is only used for troubleshooting, fraud prevention, and regulatory purposes. Apple Payments Inc. will store and may use your transaction data for troubleshooting, fraud prevention, and regulatory purposes once a transaction is completed. The rest of Apple doesn’t know who you sent money to, received money from, or where you made a purchase with your Apple Pay Cash card. To read more, get the full PDF here and check out the document revision history for January 2018. In a support article, Apple has acknowledged that the recently-disclosed Meltdown and Spectre exploits, which affect virtually every CPU in computers, mobile devices, and other platforms, also impact every Mac and iOS device. Although there are no known exploits of the vulnerabilities, Apple advises that users proceed with caution and download apps from trusted sources only. Mitigations to defend against Meltdown have already been shipped by Apple in iOS 11.2, macOS 10.13.2, and tvOS 11.2. watchOS is unaffected by Meltdown. Development of mitigations for both exploits is ongoing and new defenses will be released to each Apple OS as they become available. Our current testing indicates that the upcoming Safari mitigations will have no measurable impact on the Speedometer and ARES-6 tests and an impact of less than 2.5% on the JetStream benchmark. We continue to develop and test further mitigations within the operating system for the Spectre techniques, and will release them in upcoming updates of iOS, macOS, tvOS, and watchOS. Needless to say, this is an important update that should be installed as soon as possible. Incredibly embarrassing and dangerous screwup for a company as devoted to security as Apple. They’re working on a fix, and in the meantime you should follow these steps to change your root password (thankfully, I had guest user access disabled, so the bug didn’t affect my machine). See also: Rene Ritchie’s explainer.